Last weekend, the UW-Platteville Wrestling team sent two athletes to the NCAA Division III National Championships in Cleveland, Ohio. Juniors John Goetz and D’Andre Johnson traveled to the championships and spent the weekend battling the toughest competitors in the country. Both wrestlers had competed in the tournament before, Johnson returned for a second time and Goetz returned for a third. 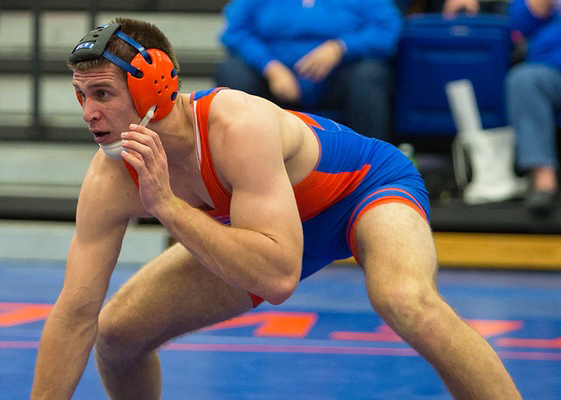 UW-Platteville wrestling history was made as Goetz became the first all-American wrestler in the program since 2010 and became the first NCAA finalist in the history of the program. Goetz was awarded the fifth seed overall at the start of the tournament with 18 athletes in his weight class. In his first match, Goetz came out with a 12-0 score, starting off his weekend in earnest. He displayed intensity in the quarterfinal with a 9-0 upset over his opponent who had been seeded just above Goetz. Goetz then took on the defending national champion in the semi-final, narrowly defeating his opponent with a 4-2 decision. The semi-final was a tough match for Goetz as he started it down 0-2. “Last year, that kid would have beaten me because I would have mentally broken under the pressure. This year, mentally, I stopped focusing on outcomes. I focused on scoring the next point and let the rest take care of itself. It was all about wrestling my hardest, and not the outcome,” Goetz said. This strategy worked well because he ended up taking second place in his weight class. Johnson performed well at the Championship too, winning his first round of the tournament before facing a crushing defeat in the second. He ended his tournament run, ranking him among the top 12 Division III wrestlers in his weight class. “D’Andre had a big pin in the consolation round and was just a win shy of earning All-American honors,” head coach of the UW-Platteville wrestling program Michael DeRoehn said. The assistant coach of the UW-Platteville Wrestling program Aaron Konitzer expressed his pride in Johnson and Goetz’s performances. “[I] Definitely had a ton of fun coaching [them] throughout the weekend, and a bunch of great memories and history was made,” Konitzer said. “We are fortunate to have the majority of our team returning for next year, but a lot can change from season to season, so we will simply focus on what we can control: attitude and effort. 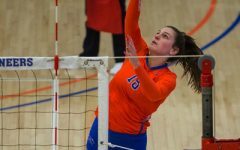 We will take some time off to recharge the batteries, then begin strength training as our first step toward improvement for next season,” DeRoehn said.